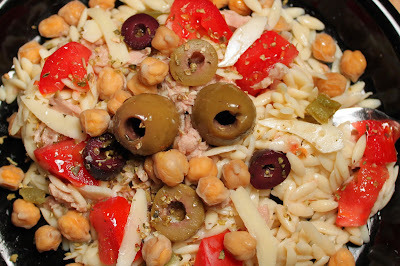 As soon as the weather seems to be turning into spring, I get in the mood for salads, macaroni salad, this is with chickpea's, peppers, olives and cheese and tuna. Orzo, an Italian pasta, is like rice, so it holds the flavors better than larger pasta. Pour the broth into a heavy large saucepan. Cover the pan and bring the broth to a boil over high heat. Stir in the orzo. Cover partially and cook until the orzo is tender but still firm to the bite, stirring frequently, about 7 minutes. Drain the orzo through a strainer. Toss the orzo with the beans, tomatoes, garlic, tuna, cheese and olives. Add enough vinaigrette to coat. Season the salad, to taste, with salt and pepper, and serve at room temperature. What a great combo! Had never thought of having both rice & pasta in one. Beautiful salad..perfect for me any time. I have to say that I need to cook and eat more orzo in my life! This salad is great, making my stomach growl! Have a great weekend Claudia! I love the kalamata olives and garbanzo beans in this salad. Perfect for a picnic. a great,great salad!i wish you a nice week-end! Oh Claudia! What a boldly flavored and beautiful salad! We had a little taste of Spring this week but tomorrow it's supposed to be snowing or sleeting or some such ugliness. that's okay I'd eat this anytime! orzo is a comfort food for me. My mom used to make this when I was sick or how you made it over the summer. brings back great memories! This just jumped out to me! I love Orzo - perfect light-come-on-spring food! I am a white sauce fan--the more garlic the better for me! This looks super good. I love orzo and I like all the combination of flavors in this dish. I think I need to make this next week for my lunches! Wow, it looks perfect. Great recipe! This salad is jam-packed with goodness and lots of delicious flavors! Love it. Now that's my kind of salad! Spring summer whatever, orzo, olives, and peppers I'm lovin' it! Reminds me of a nicoise salad, but more appealing by far!